This is a less well-known workout than some of the others on this list, but the killer combination of heavy lifting and anaerobic sprints will serve your muscle-building efforts well—and maybe make you revisit your most recent meal a bit along the way. Start with a set of 10 back squats, using a weight you know you can handle for 10-12 perfect—and I mean perfect—reps. Going too light is far better than going 1 ounce too heavy! And make sure you sprint at a speed you can handle without risking serious injury. Once you rack the weight, go right into your sprints at the nearest open space, or if you’re in the gym, hop on the closest treadmill. 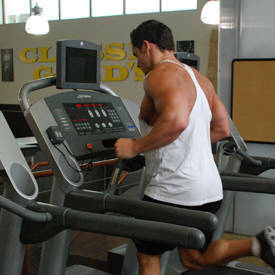 Sprint for 80 yards, about 0.04 miles or the length of a basketball court if you sprint down and back. Return to the rack, and do 9 reps followed by another sprint. Repeat until you’ve performed all 10 sets, counting down the back squats until you finish with 1 rep on the final round. Use this WOD as a warm-up before you hit hamstrings and calves. Protocols like this do exist in the bodybuilding world. Exercise physiologist Jim Stoppani, Ph.D., has designed workouts that call for weights and cardio back to back, as has Kaged Muscle founder Kris Gethin. Weightlifting and sprints are both anaerobic exercises, and both are capable of building muscle and burning fat. 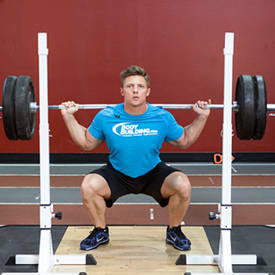 Keep in mind that the weight you use for the back squats should be light enough for 10-12 perfect reps, and make sure you sprint at a speed you can handle without risking serious injury.